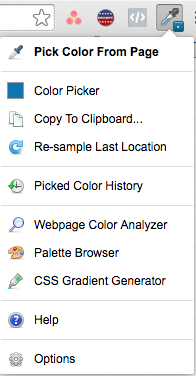 ColorZilla is a browser extension that allows you to find out the exact color of any object within your web browser. This is especially handy if you want to match elements of your page to an image located on the same page, for instance. You can first find the color using the ColorZilla extension and then paste it directly into the HSLA color panel within the editing palette in PageCloud. Find out more about ColorZilla.